Laissez Les Bon Temps Rouler as Eureka Gras returns for 2016! Saturday, January 30th at 6p.m. This fantastic night parade follows the usual parade route from the Carnegie Public Library, down Spring Street to the Court House on Main Street. After the parade downtown there will be Second Line Dancing at 7 p.m. and a Black Lite Ball at the Grotto Wood Fired Grill and Wine Cave at 10 Center Street at 8 p.m.
Saturday, February 6th at 2 p.m. The second Mardi Gras parade, led by the Krewe of Krazo, will roll downtown on Saturday, February 6th at 2 p.m. The 2016 Theme is “Hooray for Hollywood”. That night, the Mayor’s Ball will be hosted by the Basin Park Hotel with cash bar at 7 p.m. At 8 p.m. enjoy DJ Testube featuring live vocalist Opal Agafia plus mysterious performances by Melonlight Dance Ensemble. Be fabulous and dress in the colors of the evening: black, silver, gold, and red. This event is sure to be a night to remember! Sunday, February 7th at 11:00 a.m. The next morning on Sunday, February 7th, those who are up for it after all the parties will hit the New Orleans-style Jazz Brunch at the Crescent Hotel at 11:00 a.m., featuring live music entertainment. Reservations are required and may be made by calling 479-253-9652. Tuesday, February 9th at 6:00 p.m.
On Fat Tuesday, February 9th, the final event is the Saint ‘Lizbeth King Cake Ball and dinner. Dinner & music begins at 6 p.m. at the St. Elizabeth Parish Center at 232 Passion Play Road. An oyster bar, Red Snapper Ponchartrain and praline King Cake are sure to satisfy. 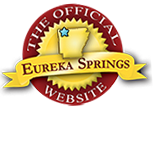 For lodging, attractions and more to do in Eureka Springs, please visit EurekaSprings.com. For more information on all Eureka Gras events, visit EurekaSpringsMardiGras.org . This entry was posted on January 15, 2016 by service424 in Arts & Culture, Basin Park Hotel, Crescent Hotel, Eureka Springs Lodging, Family Fun and tagged Ball, Erueka Gras, Eureka Springs, festival, Mardi Gras, parade.